Please note this is still a work in progress, more (and better) pictures of both basses will be added as soon as I've made them and I may add some more text, specifications and dimensions here and there. I know it may seem odd to review a bass that's more than 25 years old and hasn't been produced since. But I also know there are many lefties out there who are looking for these and who may be eager to try them out, so I thought it might be a good idea to discuss these basses here, and the difference between the two versions of the MC924L that have been available. Owning both versions, I can easily compare them. When the Musician series were introduced, together with the Studio and Roadster range, they were the absolute top of the bill in the Ibanez arsenal. The first Musician basses featured sandwich bodies, and all Musician basses had laminated through-body necks mounted at an angle. There were both active and passive versions. The first run (of 1978) included the 22 fret MC800 and MC900. The jack was mounted on the face of the body rather than on the side, as on later models, and was a notorious weak spot as the wood surrounding the jack was fairly thin. Many MC800's and MC900's found on eBay show cracks in the wood around the jack. The MC800 was a passive version with just one Super 4 singlecoil positioned close to the bridge, with a rosewood fingerboard. The MC900 was an active two-pickup model with an ebony fingerboard. Both had a 5-piece maple/walnut neck through body and mahogany body wings with ash facings, and were available in both a natural finish and a Dark Stain finish. In late 1979 Ibanez switched to 24 fret models with deeper cutaways, which shared most of the specs of the 800 and 900. The single pickup model was discontinued and replaced by the MC824, a twin-pickup passive model with a rosewood fingerboard. The MC900 was replaced by the MC924, and the preamp was modified slightly and now also featured a preamp gain pot to cut and boost the overall EQ level. This feature was discontinued again in late 1982. An 8-string MC980 (that was discontinued shortly after) and a fretless MC940 based on the MC924 were also introduced. An MC940 can easily be distinguished from a defretted MC924 by its position markers on the face of the fingerboard. On the MC924 there are large dots positioned on the middle of the fingerboard, whereas on the MC940 there are small dots positioned near the edge on the treble side of the fingerboard. The MC924 was also produced lefthanded, and some lefty MC940's are known to exist. In 1982, Ibanez abandoned the sandwiched bodies and switched to solid ash body wings. Bodies were more ergonomically sculpted, the hardware was replaced and the bridge was placed slightly further backwards, enabling a tighter neck joint at the 17th fret instead of the 18th. The headstock was also shortened slightly, creating a more compact and ergonomic instrument. The neck was also a fraction thinner and narrower. The Super 4 pickups were replaced by the new Super P5S splitcoil and Super J5S singlecoil on the MC924 and MC940. A single-pickup model MC824 was reintroduced too, with passive electronics and a quadracoil Super J6 humbucker that was switchable between series, parallel and (humcancelling) singlecoil modes. The preamp gain control was abandoned, and the pickup selector switch was replaced by a balance pot. Also introduced were two new colours besides the Dark Stain finish that had been available on the previous models: Polar White and Metallic Black. The MC924 was produced lefthanded, but according to catalogs only in the Dark Stain finish. Peter McCulloch (pjmuck) once linked to a website of an Australian store who had a Polar White MC924L in stock though, but this is probably very rare. In its 1982 appearance, the MC series evolved further and went through various hardware and electronics changes (2-band EQ, two J6 humbuckers). Sleeker versions of the MC were also introduced, before finally evolving into a shape very similar to the Soundgear series, which was introduced in 1987. I won't discuss these later versions here, as no lefthanded versions of these are known to exist. Therefore I don't think they're of interest here. The basses I own both are MC924L's, one made in 1981 and one made in 1983. The 1983 already has the newer preamp without the preamp gain pot and with a balance pot. Both are finished in the wellknown Dark Stain finish. In the picture below, the 1981 is positioned to the left and the 1983 to the right. The 1981 is completely stock except for the thumbrest that was added by the previous (first) owner, and is in near-perfect condition. The 1983 has been modified (I won't use the word 'upgraded' here) with gold Schaller tuners replacing the original chrome Ibanez VelveTune II tuners, and the body is well-worn with several battle scars, but the finish on the neck is still perfect. They look very similar, but the differences discussed in the above indeed produce two very distinctively different instruments. Whereas the 1981 is quite heavy, the 1983 is a true lightweight. Their range of tones is also very different, and ergonomically the 1983 is indeed a more comfortable instrument. I will get into this more closely further on. I acquired both basses for about 400 euros each but I think I have been very lucky. I've seen these sell for around 800 euros in perfect condition. The 1981 came in its original case and even with the original 1981 invoice, and had been stored in its case in the attic for over 15 years. The electronics suffered a little, and both the pickup selector switch and active/passive-switch required replacing. Luckily I could find a pickup selector switch that fitted the brown plastic tip of the original switch! The 1983 came without a case, and the electronics needed some work too. The active/passive-switch had a loose wire, and the bass pot had been turned up so far that it wouldn't rotate back anymore, and the entire pot itself had turned along, and all wires had been ripped off their solder joints. This could be solved by taking the pot apart and cleaning it, and resoldering the joints. As described above, both basses are distinctively different beasts. The 1981 is a rather long and heavy instrument, smaller players may find it harder to reach the lowest positions on the fingerboard. Being 2 metres tall and having fairly large hands, I personally don't have any trouble with the instrument but I can see how smaller players may find this bass fairly intimidating. The 1983 is more comfortable and easy to play thanks to the reduced weight of the sculpted ash body and the overall slightly more compact construction of the bass, as can be seen in the picture above. The 1981 already is a great player with a fantastic neck, but being dimensioned fairly similar to a Precision neck, it may not be for everyone. The neck of the 1983 feels just slightly narrower and thinner at the nut. I haven't measured them or looked up the neck dimensions in old catalogs, but will do so, as just the words 'narrower' and 'thinner' aren't exactly very specific. In terms of tone, the differences are very large. Both basses produce a wide range of tones, the 1981 being a bit more limited in its tonal options due to the lack of a balance pot. The pickup positioning and type of pickups chosen are different on these two basses, which adds further to the tonal differences created by the different body woods and neck dimensions. The 1981, with its Super 4 singlecoils with large MM-like exposed pole pieces, sounds bright and articulate. The neck pickup soloed sounds big and woody but retains a lot of definition and clarity with plenty of mids. The bridge pickup soloed sounds fairly weak and thin, but adding some bass on the onboard EQ beefens up the tone for a nice Jaco-like growl. The middle switch position produces great tones for both fingerstyle, pickstyle and slap. The preamp is remarkably natural-sounding and adds almost no colour to the tone when the bass is switched from passive to active, and the EQ is very effective. The preamp gain pot is very clever, and has a center indent. In the center position there is absolutely no increase or decrease in volume when switching from active to passive. The gain pot enables you to setup an EQ preset, and boost and cut the overall level so you can switch between two different tones. The overall tone is harmonically richer in active mode though, so I rarely play it in passive mode. The 1983, with its PJ-style pickups, produces a more balanced tone and is more versatile than the 1981. The neck pickup soloed indeed sounds very similar to a Precision Bass, and is remarkably quiet. The tone is a bit tighter and more refined than that of a real Precision though. The bridge pickup soloed, being placed very close to the bridge, again sounds a bit thin and weak. It's warmer than the bridge pickup of the 1981 though. It's not nearly as quiet as the neck pickup, a constant hum is audible when you're not playing. In the inbetween positions of the balance pot this hum is still clearly audible, but quieter than the bridge pickup soloed. Both basses are great and very refined instruments, and I've quickly grown attached to both of them. The electronics on both basses are brilliant and work great. These basses can easily withstand or even surpass comparison with some high end basses produced today. The 1983 is the more comfortable player of the two and the more versatile working horse. Personally I feel the tone of the 1983 doesn't really distinguish it from its competitors though. Therefore I prefer the 1981, which has a more distinct tone all of its own. I hope this review has been informative and has provided a greater insight in the MC series and the available (lefthanded) versions for aspiring MC owners. These basses are fairly rare, presumably fewer than 350 lefthanded Musicians have been produced. I don't know how many of each version of the MC924 were produced, nor do I know how many MC940's exist and how many basses have been finished in anything other than the Dark Stain finish, but I presume these are very rare as no Ibanez catalog makes mention of them. They definitely are out there though! Last edited by Jeroen on February 15th, 2010, 3:15 am, edited 1 time in total. Thanks Jeroen for a well written review on a bass a know nothing about. But, if one of these shows up on Craigslist or otherwise, I will certainly have enough information to decide if the asking price and description of condition means the bass has merit for purchase. Excellent and very informative review, Jeroen, thanks. I had no idea there was a trim pot on the preamp and since mine is supposedly an '82 I'll have to check under the hood to see what I find. You also mentioned that your '83 is noticeably lighter. My '82 is a fairly heavy instrument (close to 10lbs). No, it's not a trim pot. The preamp gain pot I described is an actual external knob on the '79-'82 model MC924 that lets you boost or cut the overall EQ level (before you curse me again for parts of your bass wandering through the room and getting lost ). Right! Time heals all wounds. I completely forgot about what I went through the last time before I went back and re-read the archives. Yeah...I don't want to go through that again! On another Ibanez note: I've been listening to old Joe Jackson stuff lately. Man, Graham Maby had such a unique sound on those early recordings. That'll be my next search. Wow another very informative and well written review. Jeroen and pjmuck - you should start an on line gear review site - amazing! Actually nevermind you're turning this board into one anyway. It's very helpful because as you know we lefties often don't get to try stuff out in stores. This is a Reviews forum, it's made for gear reviews. Thanks, I enjoyed writing it and actually learned some new stuff about the Musician range while browsing for background information . I'm a bit of an Ibanez nut, and I always like to learn more about them. I own a fretted version of the bass that Sting is playing in the picture and to the best of my knowledge the fretless version is custom made. It's a 1979 model with on board graphic EQ and pre-amp. 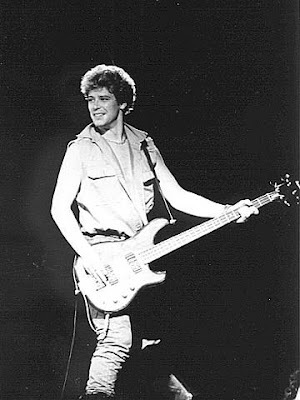 Adam Clayton from U2 also played one (with frets) back in the day. I think Adam Clayton played a passive MC824, not an MC900. He can be seen playing that on the original Live Aid. The bass was sold right after Live Aid in a charity auction. I've used it extensively over the years, and found it to be one of the best basses I've played (except, perhaps, for the weight on my shoulder!). In recent years, however, I'm noticing an annoying hum when in active mode and all the tone/gains turned to max level. It seems like it is acting like a giant antenna - I can minimize the hum by standing in a certain position, but if I rotate even slightly, it comes back full force. I've read complaints about this on other forums. Just wondering if it is a function of aging pickups and electronics, or other, and how it could possibly be corrected? Thanks for any help you folks can provide on this. I've recently posted asking advice about the value of my MC924L which I hope to sell. It has been suggested you might have an idea what it's worth. but if I rotate even slightly, it comes back full force.